The missus and I are both LEGO fans, and are slowly building our collection. We have a number of Star Wars sets right now, and we are contemplating the Kingdoms sets, the City stuff, and the latest Imperial Flagship. Did I mention I really love my fiancee? Is it terrible for wanting this kind of thing despite being 25? This is what you have kids for. Guilt-free LEGO obsession "But honey, it's for the kid." I've been fighting off the desire to buy myself a large lego set for the last three years around the holidays. Large like $100 or more, the kind I got only once or twice as a kid. I "happened across" the newest Kingdoms castle set for $30 off on Amazon just now. Is it terrible for wanting this kind of thing despite being 25? Legos were my favorite thing ever until the Playstation came and ruined it. The worst part is, I have a lug of them in my closet from which I could probably build an off-color version of that castle. Buy it build it and love it. In the Lego community you are emerging from the 'Dark Ages'. That is the time between you feel you are too old for Legos and the time you realize you still want to play with them. Step one, completed. It'll be here tomorrow, and I'm off. I also bought a second set, a $20 one called Outpost Assault. It has a working catapult, couldn't resist. Check out Ldraw.org for virtual building, Brickshelf for browsing cool stuff, and Peeron for reference. Also, Brickarms and Brickforge make outstanding custom weaponry for minifigs. 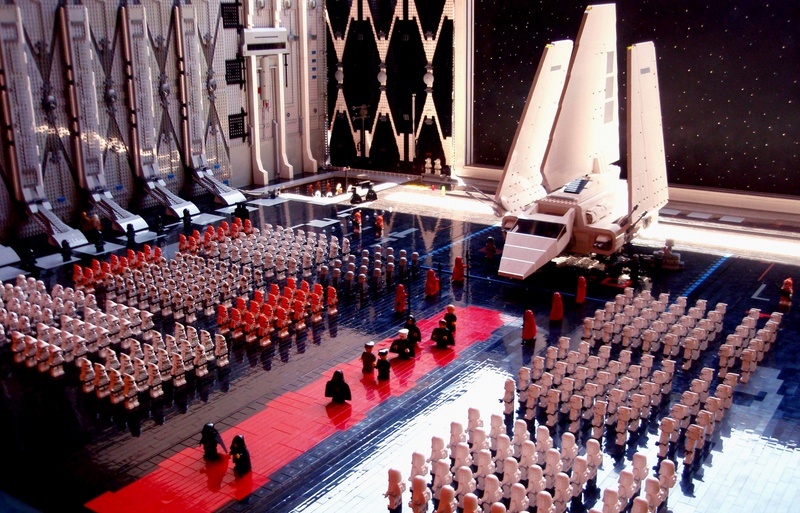 Somebody has made the emperor's arrival in Jedi in lego. That is not ROTJ though, those are Clone Troopers. My girlfriend got me this for my birthday... What can I say, She is AWESOME! OK, here's a guy who built a life-sized, wearable Master Chief costume... out of Lego. Sometimes I feel like a computer / internet / game nerd. Then once in a while I get a dose of the feeling of normalcy. 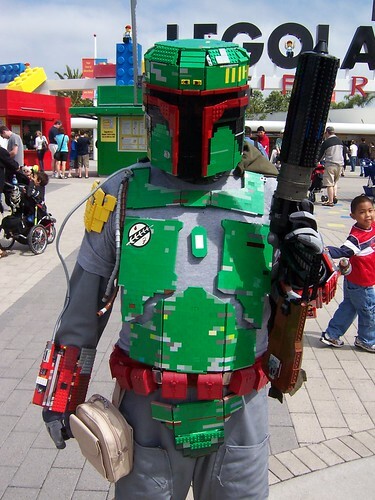 I saw a guy in a Lego Boba Fett costume at DragonCon once. I have a picture somewhere, I should find that. Damn. That is a thing of beauty. This kid does not look as happy as he should in that. I was listening to DG Radio today and they talk about Legos in the most recent episode. How did I not know there was a Lego D&D game? That's awesome! Has anybody played it? No, but I'm interested. Reading on BGG, it looks like Heroica is a step more advanced than the previous Lego board games—meaning it's approaching a Hero Quest level of complexity, i.e. not much but better. For anyone with kids the right age, it looks like a no-brainer. I love that your character's stats are represented by his physical backpack of pieces. Yeah, it's definitely going on the list of Legos to get my nephew once he's a year or so older. My kids have all four sets, and have linked them together to make "super Heroica", as they call it. Simplistic, sure, but still kind of fun. It's most definitely the D&D starter drug. Tested.com is doing a video series where they are building the death star (~3800 pieces) and the super star destroyer (~3100). I'll be interested in seeing what building the star destroyer looks like because it actually looks pretty boring even though it's huge. It's too bad I'm not getting paid this semester because I'd totally by that death star right now if I had $400 to waste. I just bought the batman/catwoman set, the superman/lex luthor power armor set(which was an absolute blast to put together) and the batman vs joker batplane/joker copter, the copter was fun to put together. I need to get the batcave and the batmobile/twoface set as well. 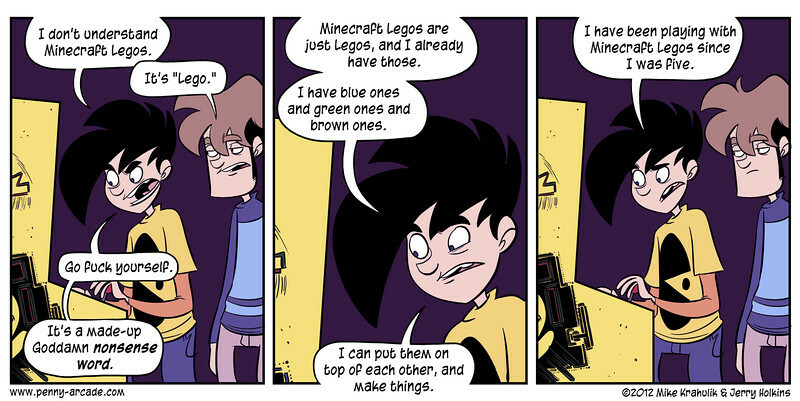 They did a Penny Arcade about that a couple days ago. Yeah, it was linked to in one of the many Minecraft threads. I'm guessing we'll get bricks with tree, leaf textures? Brown bricks with green tops for grass blocks? Cobble & brick blocks? Creepers I hope! I do plan to buy some. And it's the guy's first crack at a custom set. Wait, there's a LEGO Sopwith Camel set? *runs and checks* Want. Want. Want. I played Red Baron all the time as a kid and spent a lot of that time pouring over the manual with all of its plane diagrams and history. I'm going to have to buy it. I ran, gasping to look it up. Snoopy gave me the spark to learn all about the Red Baron. I think I need to build me one of those. Yes, they have a Sopwith Camel set, and I've seen it on display in one of the Lego Stores here in Boston. It's really impressive. If you want one, better get it quick, because their online store says that its "hard to find". Which means pretty soon, the only way to get it is Ebay. Well, I'll check the mall close by this weekend. If they don't have it, I'll probably just pass because $100 if a fair chunk of change.